It’s been a week full of cooler than average conditions and spotty showers. And that same pattern doesn’t change through the rest of the week. Both today and tomorrow will feature a blend of sunshine and clouds. While the sun will feel nice when it does pop out, it’s the type of set up where that sun is self-destructive. That essentially means it will fuel new clouds. Like past days a few very light spot showers are also possible each day, but the vast majority of New England cities and towns will stay dry all day, and even those that do see rain will only see it briefly. High temperatures will remain locked in the 50s at the coast with an onshore wind, but we’ll reach the 60s inland. Saturday starts off dry, but rain will spread in through New England from southwest to northeast. 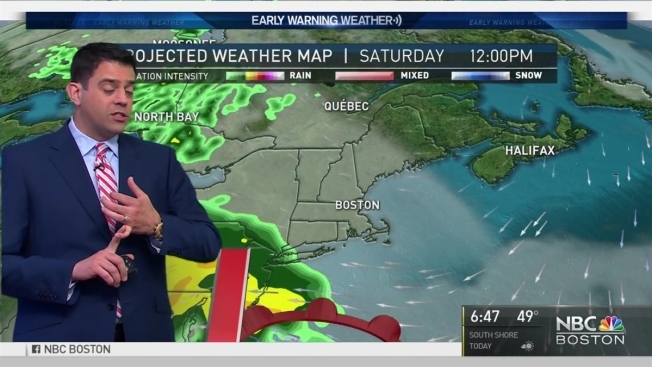 That means rain starts during the morning in parts of Connecticut, before then spreading into the Boston area during the afternoon. Soaking rain and gusty winds will arrive Saturday night into much of Mother’s Day on Sunday. Some areas will see 1-2” of rain, with rivers and streams no doubt rising in the face of that and our overall damp pattern. A shift in the pattern is on tap for next week, with warmer times ahead by then.